The Alberta Coal Branch of the Grand Trunk Pacific Railway (Canadian National Railway from 1920) runs south-west into the Canadian Rocky Mountains from a point just west of Edson, Alberta. The area was popular with some Alberta modellers in the 1960s because it was still (just barely) an operational branch with an interesting history -- mining, social and political. The resources here are part of materials collected for the development of a resource kit for Alberta school children. Unfortunately that resource package was never finalised, however the materials formed the basis of a 1997 convention presentation and were subsequently assembled here for web access. 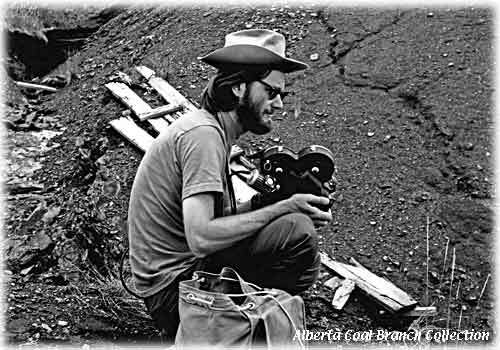 Lynn Zelmer filming on the Alberta Coal Branch c1969 for a planned multimedia teaching resource. Photo links, pdf listing with contact sheets). Photo links, pdf listings 1, 2, with contact sheets). Photo links, very large (4.2 Mb) pdf listing with contact sheets). A 2006 note (pdf file) describing the development of the Alberta Coal Branch materials and the initial ACB web site. The original photos (and electronic copies) of many of the images in the collection were deposited in 2007 with the Provincial Archives of Alberta (Deposit PR2009.0001). Three magazine articles on the Coal Branch history, operation and Coalspur, then its rebirth c 1998, posted with thanks to Les and apologies for taking so long to do so.